We’re building a personalised healthcare service that will change the way people approach their health. We think it's too hard to understand what’s going on inside our bodies — leading to big problems later on as our lifestyles catch up with us. We want to change that, hopefully with your help! With at-home tests and a slick platform, you can finally track what's really going on inside your body. And that’s just the start of it! We’re a growing team of tech, product, marketing, scientists and medical people who truly care about what we do. What’s more, we’ve got a fantastic group of investors including Seedcamp, 500 startups, Alex Chesterman (founder of Zoopla), Taavet Hinrikus (founder of Transferwise) and many more experienced entrepreneurs. Thriva was launched in early 2016 by three cofounders: Eliot Brooks, Tom Livesey & Hamish Grierson. Eliot has a genetic condition that means he has to go for regular blood tests. He was frustrated with how difficult the process was and the lack of ownership over his results. So the founders set out to change this and Thriva was born! Not only does it solve problems for people like Eliot, it also reaches a much wider community of people looking to be proactive about their health. 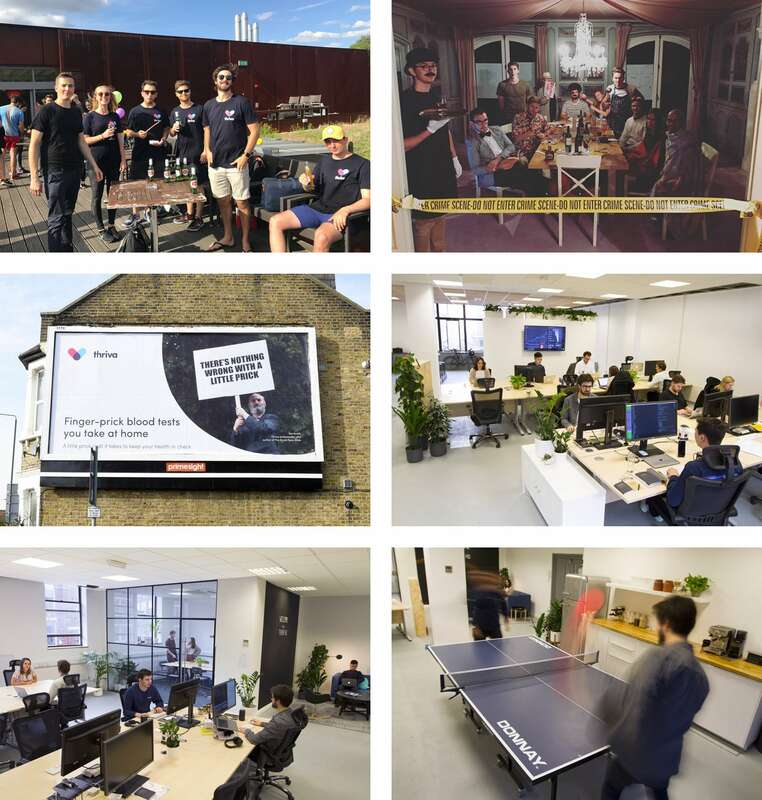 We're currently a team of 20 based in London. We have a fast growing consumer subscription product, a partner platform, and so much more exciting stuff in the pipeline. We’re creating something entirely new and we’re aware that we don’t know everything. So we’re constantly trying new things to understand how we can improve people's lives. We're looking for people who love to learn new things, are passionate about what they do, and ready for a challenge! We’re a small team so your work will have a big impact on how Thriva grows and develops. And we know startup life can be tough sometimes, so we like to bring as much fun as we can to the office. We’re looking for people from all sorts of backgrounds but it's important that you're excited about what we're doing. If you think this sounds like the right place for you, get applying! What’s it like working at Thriva? A picture says a 1,000 words, so here are 6 to give you a feel.